The Apple rumor mill has been running into overdrive in the past few weeks, and despite a lot of very creative guesswork, there is still very little that is actually known about the iPad’s successor. According to a ‘confirmed rumor’ reported by All Things Digital, Apple will be unveiling the iPad 2 on March 2nd at the BBC Television Centre in London, 6pm local time. Apple has been characteristically tight-lipped about the announcement and without any leaks on the scale of last years iPhone 4 scandal, all the ‘details’ surrounding the iPad 2 are just rumors. That, of course, doesn’t stop us from speculating and we’d say the smart money is on an upgraded display, front-facing camera and a thinner chassis for starters. Some have even suggested a USB port – but given Apple’s well-known desire for control in their hardware/software ecosystem, we think it’s unlikely. Despite its detractors, the iPad has been an overwhelming success for Apple with over 15 million units sold in the past year. Other manufacturers have been closing the gap in recent months with solid offerings from Motorola and Samsung like the Xoom and Galaxy Tab putting the pressure on Apple to once again up the ante. 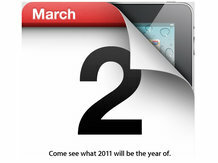 Starting Wednesday we’ll be bringing you all the latest on the iPad 2, so stay tuned.